Here at Modernize, we’re big on green energy, especially solar. As we celebrate the New Year and another trip around the sun, we are giving a tribute to the beauty of the sun. If you wanted to catch the best view of a sunset, where would you go? 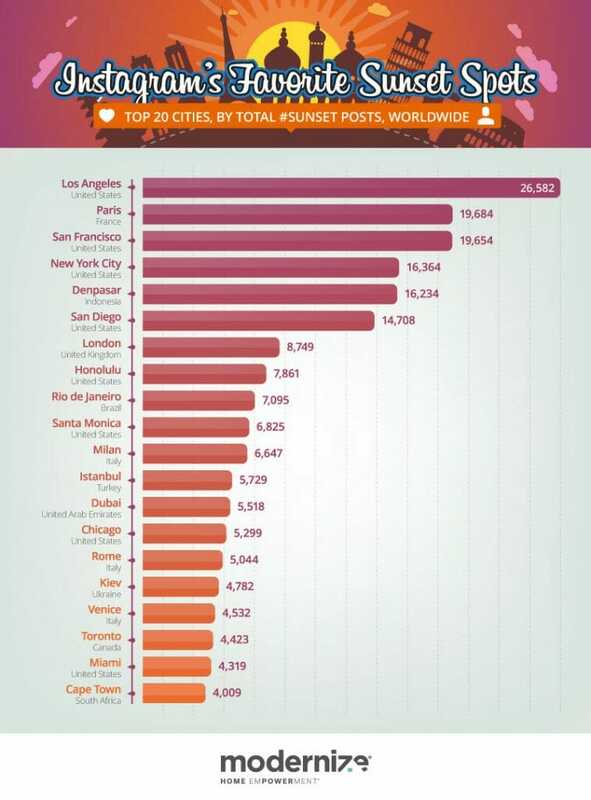 We analyzed a total of 2,515,334 images from Instagram with the hashtag #sunrise or #sunset to discover where in the world people share these photos most often. As human beings, we have a wide range of diverse interests but there is something about the sun that brings us together in admiration of the same thing. When you think of a beautiful sunrise, do Florida, Hawaii, or Maine come to mind? 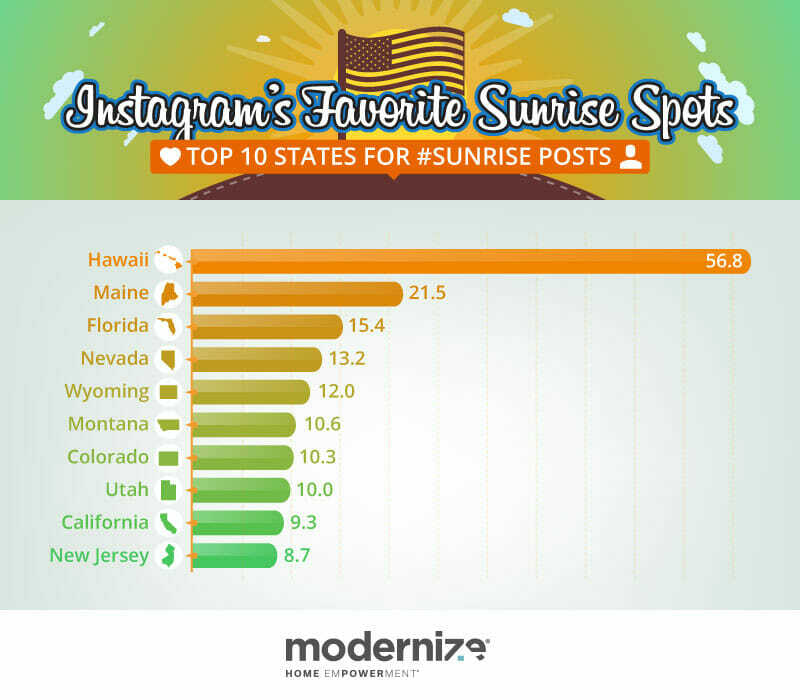 These three states lead the pack in the results for #sunrise posts per 10,000 people. 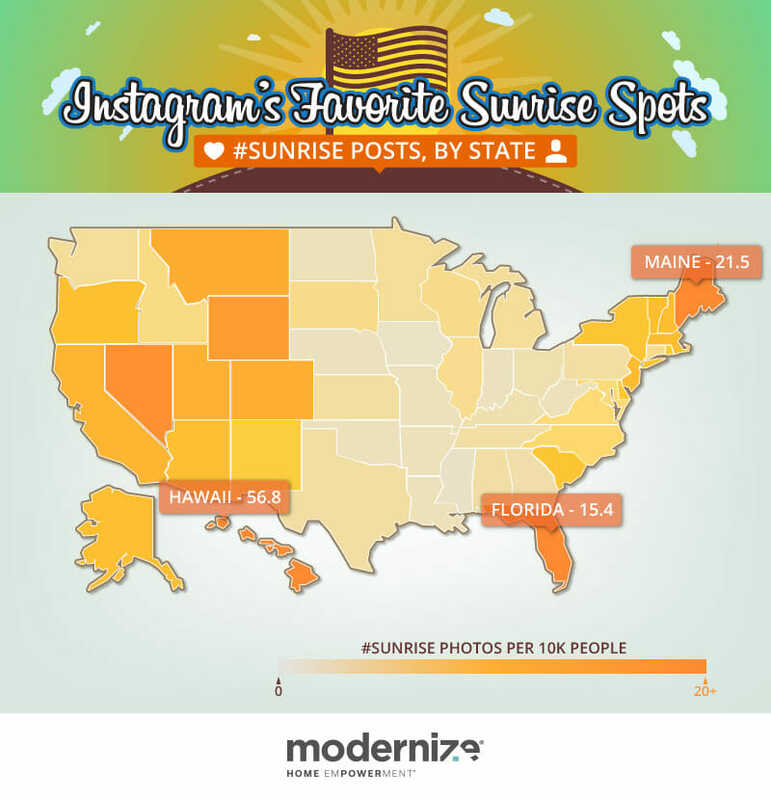 Though definitely not close in proximity, these three states have the most sunrise posts on Instagram. Why? The reasons for Hawaii and Florida seem clear – both are big tourist states, both are beautiful, and both have lots of coastline. In fact, Florida is second only to Alaska for states boasting the most coastline – plenty of opportunity to capture a beautiful picture of the sunrise! 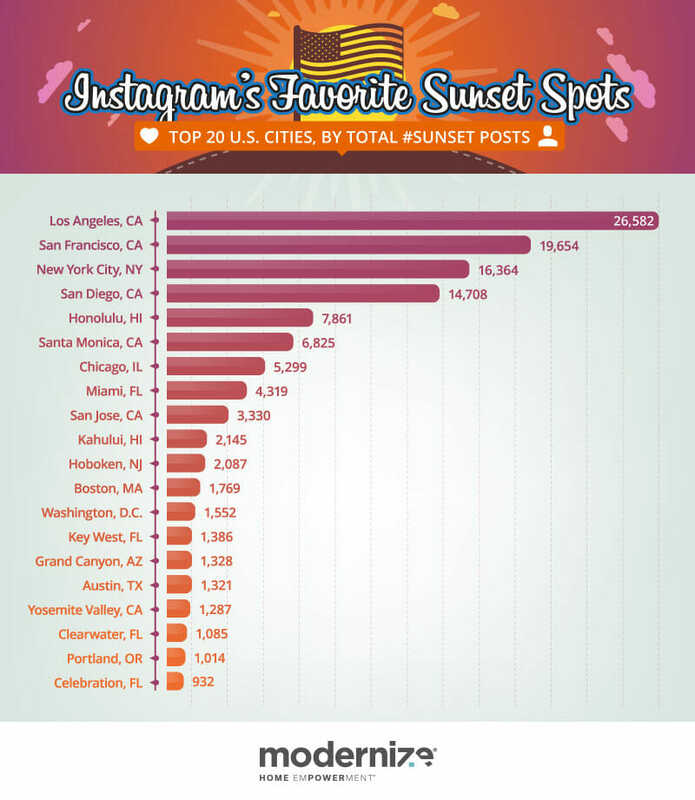 This map shows the total number of #sunrise pictures on Instagram by city. Notice the large number of cities along the East Coast? Myrtle Beach, SC, has 591 recorded #sunrise pictures; Virginia Beach, VA, has 929; and Miami Beach, FL., has 2,732! Clearly, beaches are a great place to show off a beautiful sunrise. Across the country, Lovelock, NV, stands out with 932 recorded #sunrise pictures – the highest in the state. Though seemingly random, Lovelock happens to have quite the background in tourism due to events like the annual I.D.E.S. Portuguese Festival, Frontier Days Weekend, and hot air balloon races. Tourists love a good sunrise picture. 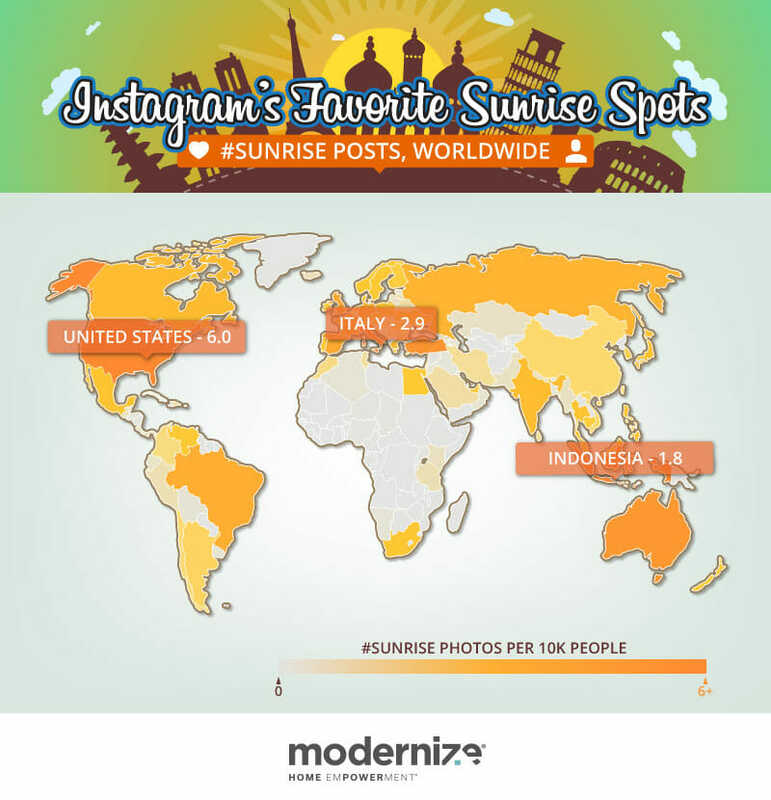 Across the globe, the countries that stand out as having the most sunrise posts on Instagram are Indonesia, Turkey, Australia, and the United States. Indonesia is known for its sunrises due to the natural beauty of the landscape. The mountains and lakes accompanying the sun rising in the morning is enough to make anyone snap a picture. From this map, you will notice certain areas (such as the United States) tend to share more sunrise pictures than others. The east coasts of Australia and Brazil are particularly popular for sunrises. Cities like Byron Bay and Bondi Beach in Australia have more than 1,000 recorded #sunrise pictures on Instagram. Australia is a beautiful place, and the cities located right on the bay are prone to beautiful sunrises that deserve to be documented. 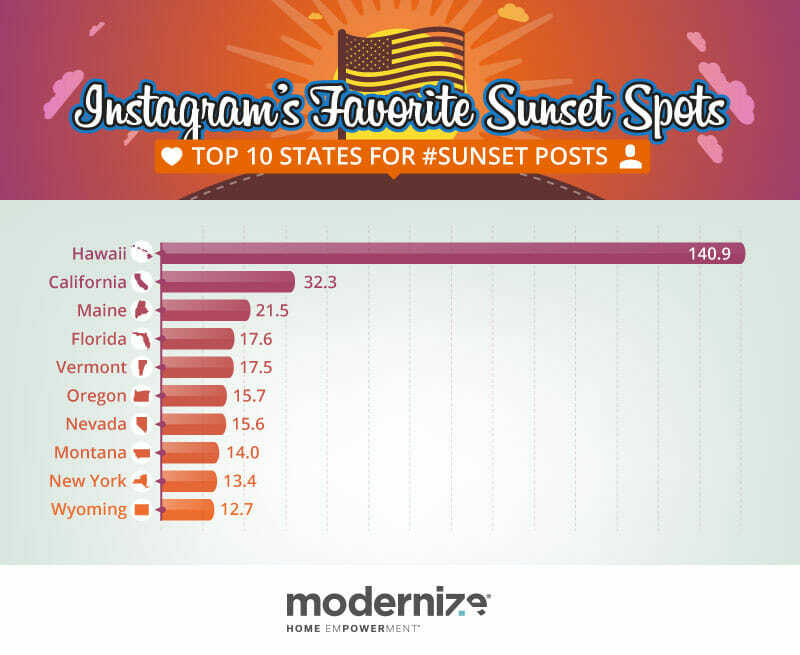 When breaking it down per 10,000 people, Hawaii is by far the most popular state for #sunrise posts – more than twice as popular as runner-up Maine. Naturally, tourists traveling to Hawaii are in search of a little bit of sunshine. It is not a surprise that when they arrive, they want to share the beauty of one of the most scenic sunrise destinations in the world. Maine following Hawaii in popularity for sunrises may seem surprising to some. With Maine’s prime location on a coastline, its residents and tourists are practically guaranteed a great view of a beautiful sunrise. West Quoddy Head in Maine is the easternmost point in the United States, which means it is one of the first places in the country to see the sun each morning, depending on the time of year. According to the Bangor Daily News, Mars Hill in Maine also gets the distinct honor of seeing the sunrise first–at least for part of the year. 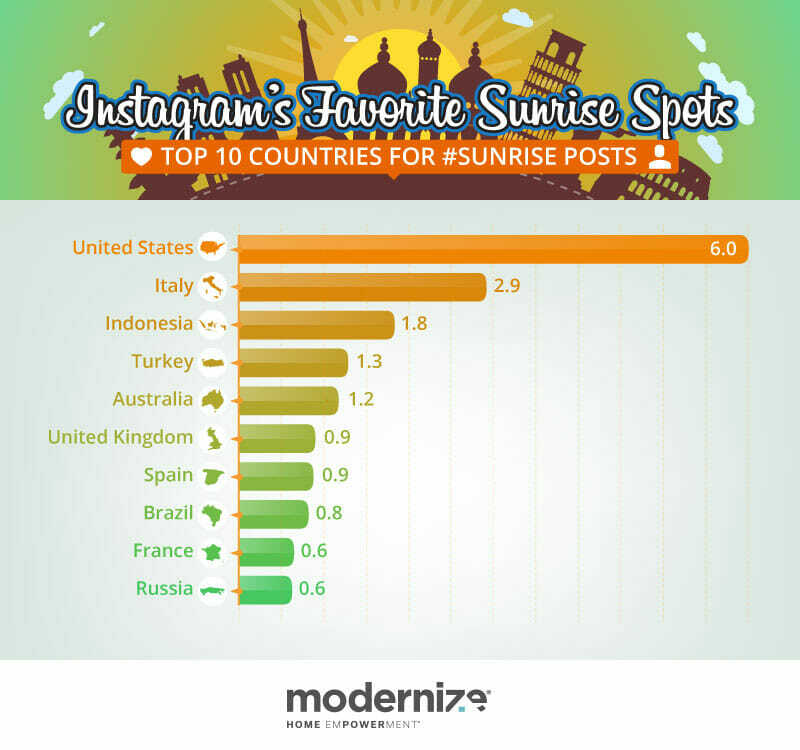 Similar to the map above, this bar graph displays the countries in which sunrises are the most popular on Instagram. The United States leads the way which makes sense with its solar obsession, followed by Italy, Indonesia, and Turkey. Though English is not the native language for many of these countries, the residents still employ the #sunrise hashtag. Even if you have lived in your state forever, it is hard to predict which spot is the most popular to snap an image of a beautiful sunrise. Here, we can see that each state has its own unique properties, so why shouldn’t it have its own unique sunrise? Instagrammers are sharing photos from various cities, as well as from diverse locations: from beaches to National Parks, mountains to boardwalks – and even an airport and a temporary metropolis. The Hartsfield-Jackson Atlanta International Airport is the most popular location for a sunrise picture in Georgia. Considering that the airport is the busiest airport in the world, it makes sense that it would stand out as one of the most popular places for a sunrise picture. Burning Man, an annual gathering that takes place in Black Rock City, Nevada, attracts tens of thousands of people each year. The more people, the more sunrise pictures there are to be taken! Comparing the popularity of sunrise pictures with that of sunset pictures produces some interesting results. #Sunrise pictures in California average at about 9.35 per 10,000 residents, whereas #sunset pictures jump to 32.3 in the same state. Most of the west coast follows the same pattern. 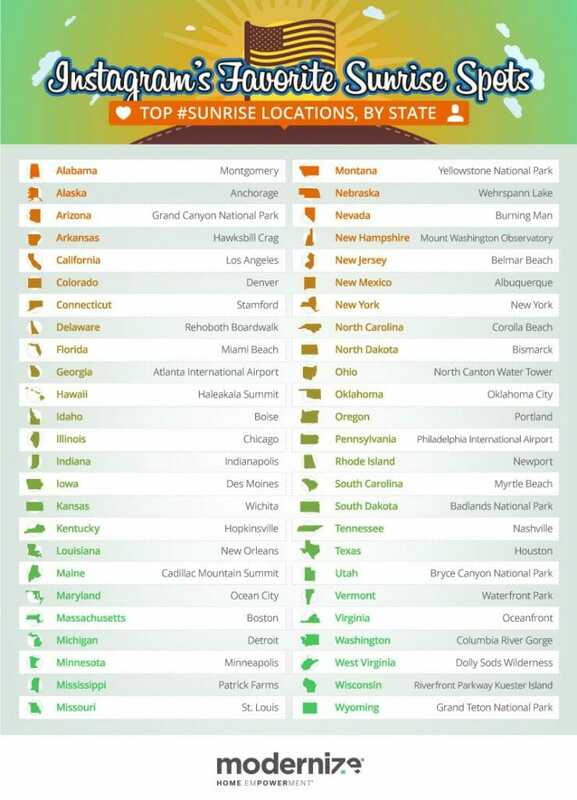 Maine and Florida are as popular for sunrises as sunsets, though states like New York see a large increase in #sunset sharing. 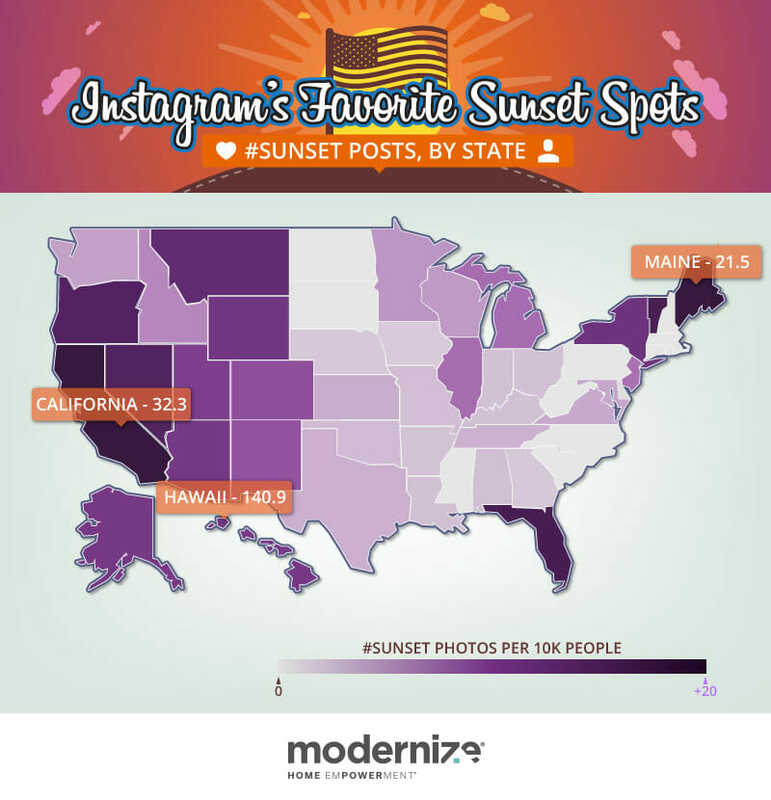 As compared with the popularity of #sunrise posts shared on Instagram, this map reveals that the west coast is more likely to share photos of #sunsets than the east coast. Cities along the coast of California share more #sunset than #sunrise pictures, as do cities scattered around states like Nevada, Arizona, and Colorado. Do people in these states prefer the night or just appreciate sleeping in? Because the sun sets in the west, these states are guaranteed some of the best sunset views in the country. Though many residents in the countries that share #sunrise pictures also happen to share a high number of #sunset pictures, a few locations stand out on this map. The United States shares almost twice as many #sunset pictures as it does #sunrise pictures. Russia shares considerably more #sunset than #sunrise pictures, as do Brazil, Turkey, and Germany. At a glance, sunrise and sunset photos worldwide may look similar, but if you look closely you’ll see a subtle shift to cities sitting along the western coasts. The western coasts of both Spain and India have a stronger presence when researching #sunset pictures. The west coast of the United States seems to share more #sunset pictures as well. But what about Brazil and South America in general? According to TimeAndDate.com, many areas in Brazil see the sun set as early as in the 5pm local time. The earlier the sun sets in any particular region, the more likely there are to be sunset pictures taken. Hawaii comes in strong again with about 140 #sunset photos for every 10,000 people. That is an incredibly impressive number that ranks Hawaii as the biggest #sunset sharing state by a percentage of about 125.6%. Unlike the #sunrise bar chart, California follows Hawaii here in second. As the previous maps have shown, California and most of the west coast seem to be more interested in sharing the #sunset than the #sunrise. 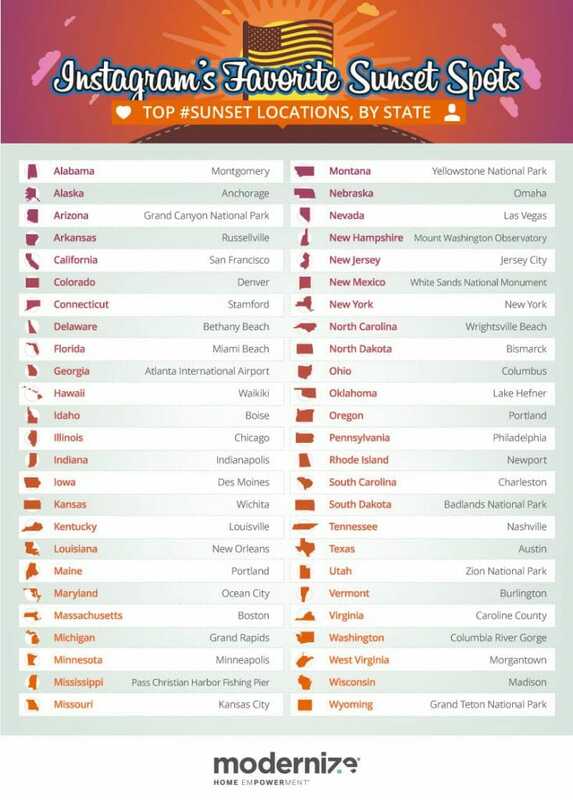 New York makes an appearance on this chart as well, though the highly populated state did not rank for #sunrise pictures. New York is the home to a city that supposedly never sleeps – maybe they only rest in the morning. 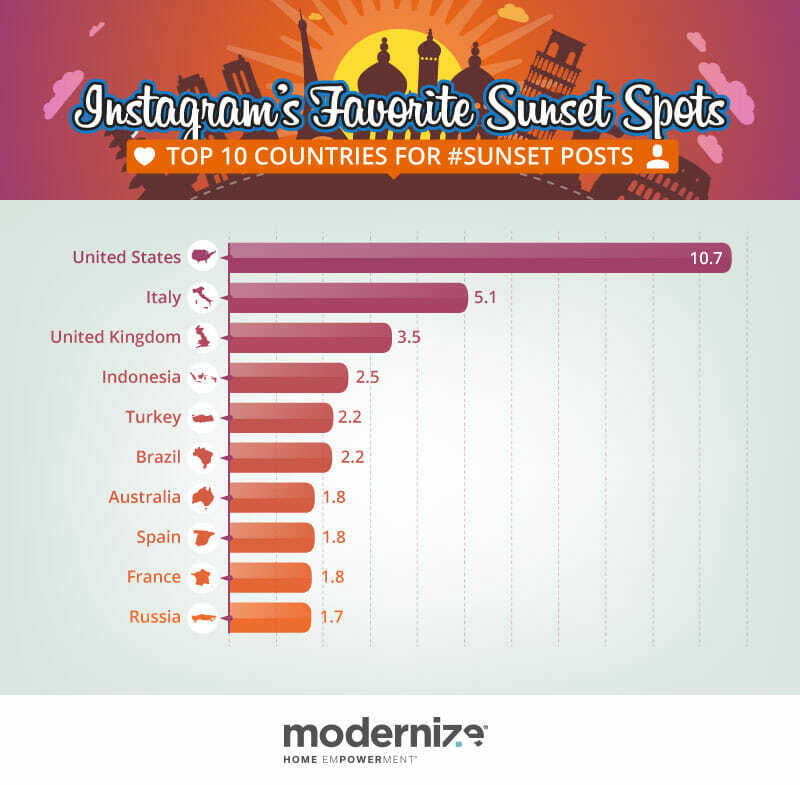 Though the most popular place on Instagram for the #sunrise and the #sunset happens to be the United States, the #sunset seems to be more popular for some countries than the #sunrise. All 10 countries make both lists, though the order varies a bit. It seems that the #sunrise is more popular in Australia than the #sunset. The United Kingdom is in the top three countries for #sunset posts but it doesn’t even make the top five for the #sunrise. Looking at the most popular places for sunsets across the United States reveals similarities. Georgia’s Hartsfield-Jackson Atlanta International Airport makes a repeat appearance, which makes sense considering 96 million people pass through each year. Utah’s most popular place for a sunset picture is Zion National Park, though the result differs from its most popular sunrise spot: Bryce Canyon National Park. There are a few reasons this might be true. It is easy to visit both national parks in the same day, which means people may be saving Zion for the early evening and visiting Bryce in the morning. Zion National Park receives over 3 million visitors each year while Bryce Canyon receives more than 1 million. Sure enough, the Golden State is home to some solid gold sunset shots, whether from the Hollywood Hills, the shores of the San Francisco Bay, or the beaches of San Diego. Other exotic or tropical locations dominate the list (hello, Honolulu! ), but there are also a fair number of Northeastern and Midwestern cities represented. It just goes to show: In warm or cold weather, a sunset can still inspire. How about the international sunset scene? Maybe it comes as no surprise that some of Europe’s most romantic locales are causing Instagrammers to record moments of striking beauty. How could even the most hard-hearted resist the allure of a Paris sunset? The big surprise here is Denpasar, the capital of Bali, Indonesia’s island paradise. All we can say is, that must be a sunset worth seeing. Hawaii and Florida are known for their warmth. Even if you have never traveled to either of these places, you might be able to envision why pictures of the #sunrise and #sunset are so common there. The appearance of places like Italy and Wyoming in the results is even more interesting and teaches us a thing or two about the world. Just because we might not expect it, doesn’t mean it isn’t worth sharing. Witnessing the rising and setting of the sun is a human experience we can all find meaning in. Maybe your state, city, or country has a great view of the sun over the water, or maybe you have a beautiful view of rolling hills from your deck. Whatever the reason for the moment you decide to snap and share a photograph of the sun’s journey, it is interesting to see a different perspective of the world. Using the Instagram API, we looked at a total of 2,515,334 photos from July 11th to November 9th, 2015. These photos included only geo-tagged posts that contained the hashtag #sunrise or #sunset within the caption. Using population data from census.gov, we determined the number of photos per 10k people on a state and country level. If you’re a publisher interested in using this project’s images, please do so! We do ask that you attribute Modernize.com for the content, and provide a link to this page, so your readers can further explore our research.